Your iPhone uses the Bluetooth 4.0 protocol. Bluetooth is a short-range (up to 300 feet) wireless protocol used to attach, or pair, devices to your iPhone. Unlike Wi-Fi, which broadcasts its availability continuously, Bluetooth has to be turned on to make your iPhone or other device discoverable so that they can see each other. A passkey or PIN (Personal Identification Number) is used to make that connection private. One of the most common devices paired with iPhone is a wireless headset. This small device is either inserted in your ear or wrapped around it and has both a speaker to hear the person you’re talking to and a microphone so they can hear you. You can have phone conversations without risking strangulation by earphone cord or, worse yet, catching the cord on something, resulting in your iPhone flying through the air and smashing on the floor. On your iPhone, go to Settings→Bluetooth and tap the Bluetooth button on. The Bluetooth screen opens. 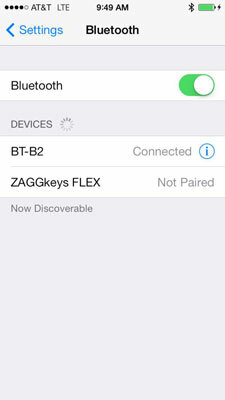 Tapping On makes your iPhone discoverable, which means other devices with Bluetooth turned on can see your iPhone. The Bluetooth icon appears in the status bar. Turn on Bluetooth on the device you want to connect so it too is discoverable. If the device is another iPhone or computer, you have to turn on Bluetooth on that iPhone or computer too. Active devices show up in a list on the Bluetooth screen on your iPhone. In the list, tap the device you want to pair with your iPhone. Enter the passkey on the keypad that appears on your iPhone, if requested. The two devices can now communicate across the Bluetooth connection. 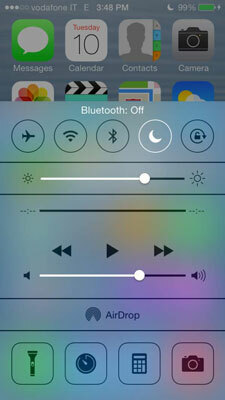 To turn off Bluetooth and make your iPhone undiscoverable, tap Settings → Bluetooth→Off. Another method is to drag up from the bottom of the screen to open the Control Center and tap the Bluetooth button. The Bluetooth button on the Control Center is dimmed and the Bluetooth icon disappears from the status bar.